Separation anxiety is a heart-wrenching thing to deal with as a parent. While it can occur anywhere and at any time, it does tend to develop more when your little one starts daycare. This is understandable, especially the first week of daycare where it’s all new and your little one isn’t used to being away from you. But what if your toddler has been going to daycare for a while now and they’re still not used to it? Or, if they’ve been perfectly happy to be separated from you to go to daycare, but now suddenly they’re clinging to you and begging you not to leave? 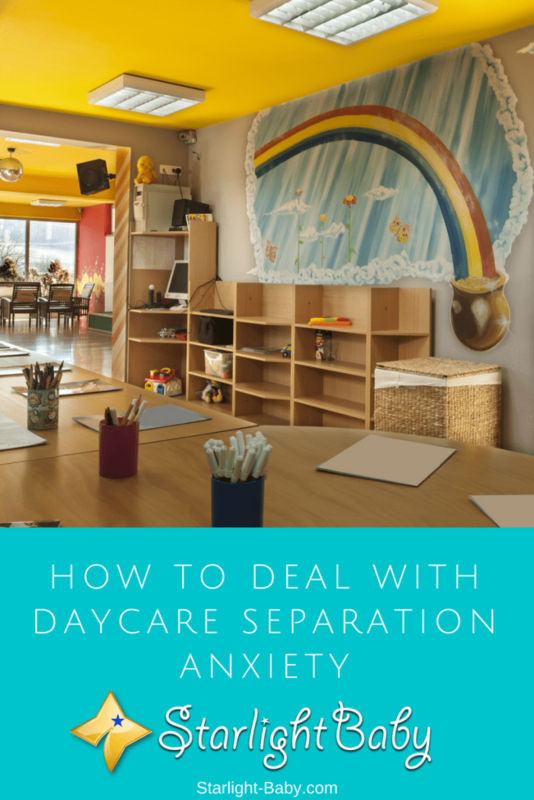 The truth is, daycare separation anxiety can strike at any time – even if your child has been perfectly happy to be left up until now, anxiety can develop seemingly overnight. So, what can you do about it and how can you tell if it’s normal, or if something else is going on? Separation anxiety is most commonly experienced on the first few days that your little one starts daycare. It may be understandable, but that doesn’t make it any easier. One thing that can really help to minimize the trauma for both you and your toddler is to simply be prepared. This means talking about daycare with your little one and making it sound as exciting as possible. Explain you won’t be able to stay with them, but you will be going back to pick them up and they’ll have plenty of fun with all of the other children there. Of course, it depends upon how old your toddler is as to how much you can explain, but talking about it will help to prepare them for the impending start. Another great tip is to visit the daycare and meet the teachers before your toddler starts. That way, it won’t be a complete shock and they’ll already recognize some of the people. This also gives you an opportunity to discuss potential strategies you can use to minimize the chances of tears when it comes time to leave. A common thing many parents do on the first day of daycare, is wait for their little one to be distracted before sneaking out. It’s logical, but this can actually make it a lot worse for your toddler. Once they do notice you’ve gone, the first thing they’re going to do is panic. They’ll feel like you’ve abandoned them and this can be a lot more traumatic than the tearful goodbye. So, instead you should always take the time to say goodbye, but keep it short. Don’t let your own fear or sadness show as this too will be picked up on by your toddler. Simply smile and cheerfully tell them you’ll see them later, before telling them they’re going to have an awesome time. It might be a good idea to stay with your toddler for a few minutes before you leave. Often, all they need is a little familiarity and encouragement before you head off and leave them to it. So, for the first few days, try to stay to help them settle in for a few minutes. It can be really confusing, frustrating and worrying to see your toddler suddenly develop a fear of being left at daycare. Did something happen and should you be worried? The truth is, it’s probably nothing. It’s common for toddlers to regress a little and go back to fearing being left alone. The question is, how should you handle it? Sticking to a familiar routine is a good way to start. Often, the regression could be down to a change at daycare. It could be a teacher has left, or there’s been some change in the daycare schedule. Whatever the change, your little one needs to know that some things stay the same. So, create a little schedule chart which you can both go over in the morning. This will highlight exactly what they need to do to get ready, and whether there’s anything going on that day that could potentially worry them if they aren’t prepared, such as a field trip. It’s also important to let your toddler know it’s perfectly fine to be nervous. The most common thing to do when your child regresses is to become frustrated and say something like “Come on, be a big boy/girl, you’ve done this so many times before”. The tough love and logical approach doesn’t always work and in some ways, can make it worse. Instead, letting them know it’s ok to be scared and reminding them of previous times they have faced their fears and been ok, can be very reassuring. Showing them a little extra attention at home can also help. You might think this would make them more upset when it’s time to leave them at daycare, but it can actually make them feel more secure and confident. So, make extra time for bonding and see if that makes a difference. Regardless of whether your toddler is distraught because it’s their first time at daycare, or whether it’s a sudden development that’s appeared a while after they’ve started, there’s a few general tips that can help. Giving your little one something to remind them of you that they can keep with them is a great idea. It could be a little handkerchief that’s been sprayed with your perfume, or a special bracelet they can keep with them just for daycare. Tell them it’s filled with your love and if they feel sad or scared, they can just touch it and they’ll feel your love. It’s surprising how well this one works and it can do wonders to comfort them throughout the day. Another thing that might work is spending less time with your toddler at home. Now, I know this contradicts the advice given above about being more affectionate, but it’s a good tip for those who spend practically every waking minute with their toddler. The trouble is, if daycare is the only time you are separated from them, they are going to find it really difficult. On the other hand, if they’re used to you leaving for short periods of time, they’ll find it much easier to settle in at daycare. Overall, separation anxiety can be a really difficult and distressing problem to deal with. However, it is extremely common and you’re definitely not alone! The above tips and advice can really help make the transition and regression easier to deal with. It will get better and your toddler will soon start to enjoy spending time with their friends without worrying where you’ve got to. Have any tips or stories to tell? Share them below! Aw, it always made me feel sad when I saw toddlers cry when their mother’s left them at the daycare. We personally, didn’t have too many problems because our boy actually loves going! Even the first day, there weren’t any issues. All I did was say ”mom’s gonna be back in a few hours, play nice” and he didn’t even shed a tear. But, prior to leaving him there for the very first time we discussed it with him at our home. Me and my partner, both sat down with him and told him the whole process, asked him if he is scared or if he has any fears. You can’t imagine how proud of him I was when it was his first time and he accepted it and was so brave. A good tip to keep the children encouraged to keep going without fear is by talking about things that happened every single day… always ask them what they did, who did they play with and so on. It helps a lot! You should be really proud of your son, Jane. He is a rare gem. With most kids, separation anxiety is always an issue. I had that problem with my youngest son – I had to be inside the classroom just so he would attend his classes 🙁 I did that for a year! The next year, I kind of graduated and just stayed outside the classroom but still can’t leave, haha. Great tip on asking him/her about things done daily. That helps to keep him/her excited to be in daycare. My daughter started crèche at the age of three. It helped a bit as she was quite expressive at this age. Talking a dozen words at once and pointing and asking questions. I was a bit lucky as she seemed to enjoy going out each morning all dressed up with her little lunch basket. Her first day, I actually decided to stick around for about an hour to see if she would cry or throw a fuss. There was only the normal tears at me leaving her after a kiss. From then on, she was the perfect little miss! She was playing and soon joining a circle and hopping around. Sometimes, I think it depends on the child’s personality. If your child is the quiet introverted type, it might take a while for him/her to get used to new environment. Gentle coaxing and encouragement usually will do the trick. If your child is extroverted, settling in quickly should be a breeze. You just need to find out if they are happy and coping with the new space. Nice thoughts there, joegirl. I guess it would sometimes depend on a child’s personality. With my youngest son, it was difficult because he was really shy so I had to be with him, inside the room, so he would attend daycare. With my oldest daughter, it wasn’t that difficult because she is very friendly and no longer “needed” me when she found new friends to play with. It’s really a different experience with every child. My son Alex cried in every morning when we took him to a kindergarten. In fact, he never stopped, after three weeks he got sick because he was crying all day until his mother was taking him from there. We had to suspend his kindergarten because he was crying too much and was making fever every day. Thre are children who support better the separation but some cannot deal with it as it should! We have a three months old baby. My wife and I have agreed that we will not send the baby to a daycare center. We don’t want to miss our baby’s growth. My wife is still on maternity leave, and soon she will continue with her job. We have agreed that until the baby is ready to go to school my wife will do a part time job and I will continue with my full time work. When my wife will be away, I will be looking after the baby and when she is back home, I will be going to work. We don’t think we can trust our baby at the hands people in the baby care centers. My wife has decided that she will continue to feed the baby from her breast for two years, therefore, she is not going for a fulltime work. True, vinaya. It’s really difficult to leave your baby/child in the hands of people you don’t know. If you, your wife or relatives could take care of your child until he is ready to go to a real school, that would be best. These are wonderful tips on how to tackle daycare separation anxiety. I have picked out a few tricks to use with my son whenever it’s time for daycare separation. He is a child who dots on me a lot, so leaving myself is always difficult for him and myself included but with preparation on how to deal with it, I’m sure we would find a working ground to suit us both. The baby is one year old now. In the past year, my wife was working parttime because she had a great responsibility to look after the baby. Even though our parents looked after the baby when we were gone for work, my wife could not work full time because she was nursing the baby. This year, she had decided to opt for full-time work and we have agreed that my mother will look after the baby. We will never trust our baby in the hands of day care.